In July, I posted a two-part professional book review for Simon Sinek’s Start With Why: How Great Leaders Inspire Everyone to Take Action (Part 1 and Part 2). 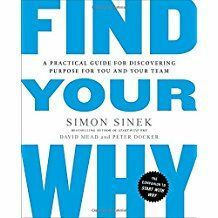 While traveling in the U.K. earlier this month, I slowly read and worked through Sinek’s follow-up book: Find Your Why: A Practical Guide for Discovering Purpose for You and Your Team. He coauthored this book with David Mead and Peter Docker. I was eager to read Find Your Why because of a nagging question from the previous title. While I truly believe everyone must find her/his own personal “why,” I also believe a “shared why” is an essential component of collaborative culture schools. In the past, I have served in schools where faculty have a shared sense of purpose. These have been the most productive, effective, and satisfying work experiences in my career. I have also worked (hard) as a member of a faculty with no shared why. Such an environment does not foster trust, collaboration, or innovation and results in a dysfunctional environment for growth and change. Find Your Why begins with connecting readers with the why/how/what content of the first book. In the introduction, the authors write this: “Happiness comes from what we do. Fulfillment comes from why we do it” (7). These ideas spoke to me, and I kept them in mind throughout my reading. Subsequent chapters include discovering your individual why, two chapters on strategies for “why discovery for groups,” a chapter on “hows,” and the final chapter about taking a stand for your/your tribe’s why. Sinek, Mead, and Docker offer a compelling strategy for discovering one’s own why. It involves identifying ten impactful stories from your personal and professional life. (I used the two weeks of travel to consider, reconsider, and identify my top ten stories). The authors offer two strategies to help you select your stories: peaks and valleys and memories prompts. After you are satisfied with ten, you identify a partner to help you explore the themes that inform and connect your stories. Your trusted partner in this process must be able to be objective (not a relative or very close long-time friend). My ten stories are ready for prime time. Of course, I see themes and think I could compose my draft why statement today. However, I intend to follow the authors’ process. I have a short list of people to ask to serve as my partners to listen, to make notes, and to see the themes from their perspective that connect my stories. I am excited to learn what she/he sees that may be the same or different from my view. Next week, I will reflect on the “nested WHY” information in the book. “The goal is for each individual to work for a company (with a school faculty) in which they fit the culture, values, believe in the vision and work on a team in which they feel like they are valued and valuable” (85). Sinek, Simon, David Mead, and Peter Docker. Find Your Why: A Practical Guide for Discovering Purpose for You and Your Team. New York: Penguin, 2017. This entry was posted in Professional Book Reviews and tagged professional development by Judi Moreillon. Bookmark the permalink. Thank you very much! I am so glad I read your article by reading the post from LM_NET. I would like to join your blog. I am a high school library director who is fortunate to teach many classes throughout the school year, help design curriculum, and continually challenge myself as a teacher-librarian. Thank you!